In the last few years I have made an earnest effort to travel to India at least once a year. The gravity of my roots – the love for friends and family – has an uncanny ability to overpower the pragmatic aspects such as finances. Thankfully my soon-to-be-eight year old is as keen to travel as his dad. However, this year was an exception – I had to make two back-to-back trips in June and July-August. My mom has been fighting an early onset and steady progress of vascular dementia for three years and counting. On top of that, she was diagnosed with Parkinson’s Disease last October. A sudden surge in symptoms towards the end of May required hospital admission. While the physiological reasons were multiple, we suspected her breakdown was caused by the shock from the worsening health and subsequent demise of her older brother who was very close to her, and possibly her favorite of eight siblings. The fact that this brother was an octogenarian did not help her grief. 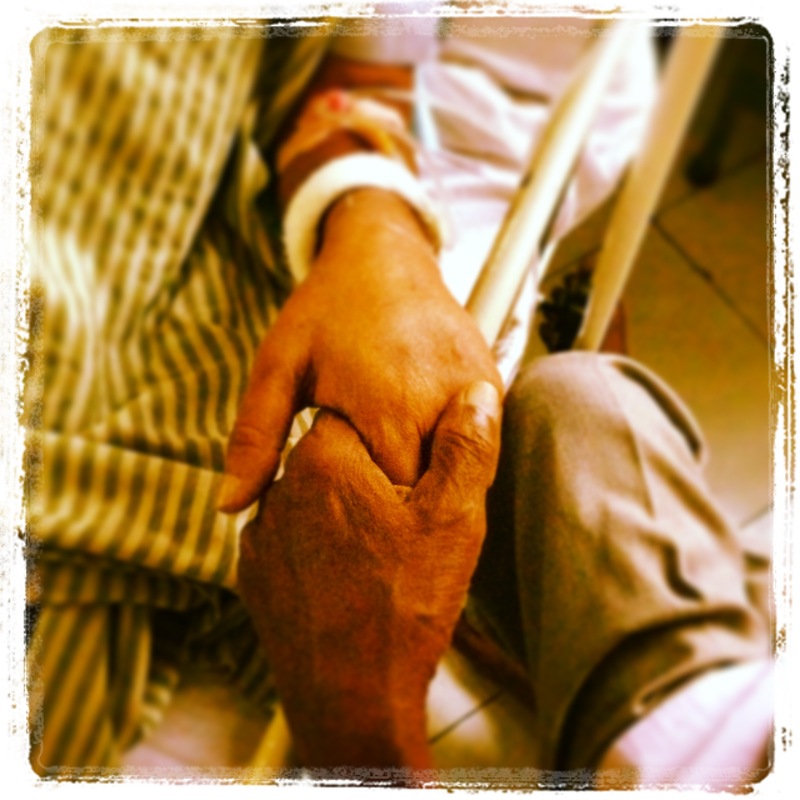 My mom, who is yet to be 70, was admitted to nearby medical college, with deteriorating mobility, speech and cognition. My dad, several years older to my mom, also showing signs of aging (all physical), maintained his rock solid composure and calmness as this happened. He called and apprised me of the situation. Thanks to his genes, I was able to take it without significant distress. He also called up my uncle (Kakumoni), his recently retired younger brother who lives about 100 miles away. Kakumoni, always ready to help out, took no time to pack his bags and come to my father’s help. My youngest aunt, dad’s little sister (Chhoto Pishi) and her family also stood by his side as he took to the matters. A week went by, Mom’s condition showed little improvement as the resident physicians attended to her physical ailments, postponing her neurological and psychological needs. (Although, to us, in our unqualified medical opinion, this approach was stupid at best; only, we were all proved wrong in the long run). On the 10th day, during my morning update on my drive to work (which coincided with their evening visiting hours at the hospital) from my dad, I learned that mom was no longer communicating. Her discomfort, agitation, and frequent unsuccessful efforts to grieve her brother reduced to occasional moans and subsequently to a deep slumber. Not agreeing with my dad’s assessment (which was influenced by his concern for my financial inconvenience and interruptions at work), I decided to take the next available flight home. Her condition worsened the next day, and as I boarded my flight, I prayed for her – rather selfishly, as I wanted to see her at least one last time. My prayers were answered. I landed in the wee hours of dawn, red-eyed, sleepless for a day-and-a-half (I find it impossible to sleep in flights, and the situation at hand only made it worse). My mother-in-law, who was waiting to pick me up at the airport confirmed that mom’s condition had remained unchanged. I spent the next couple of hours restless at my mother-in-law’s waiting for the morning visiting hours. My mother-in-law and my mom’ have been closest of friends since before I was born. Her unwavering belief that mom will surprise us with a comeback was heartening, but did little to comfort me. I met Dad and Kakumoni at the hospital entrance and walked upstairs to the ward with an hour to go before the official visiting time. As I walked towards the doors to steal a glimpse ahead of the visit, I could feel the anxiety bouncing in my stomach. There she was, reclined, eyes closed, in pain yet calm, her hands restrained to the bed. (Dad told me that she had accidentally dislodged her Ryle’s Tube a few days back and hence the restraint). A mix of emotions confused my thought process – happiness to see that she made sure that I got to see her, sadness to see her unresponsive, anger seeing her restrained and worried about the uncertainty of the near term future. I was the first to step into the ward as the doors opened with Dad by my side. I took her hands, bending down to get a closer look, rooting for her and hoping that she had a fighting chance to recognize me, perhaps even utter my name! Her eyes opened, her lips shivered for a fleeting moment and then tears rolled down her eyes. It took a few attempts, but she was finally able to utter her first words in days – “Babin”. I stood there – bewildered, smiling, with moist eyes…my dad put a comforting hand on my shoulders, sharing the moment. She improved over the next 10 days, gradually regaining her ability to turn her face and then, with a little bit of assistance her body. Words were few and far between, yet it was enough to make us hopeful. Her grief for my departed uncle was her first order of communication directed towards me. Once she got it out, she felt better. However, it did not take her long to realize that my visit was temporary and she would not be out of the hospital before I returned to the US. Thankfully, ( for her sake as well as mine) I still had a card to play – I was going to be back in a month – and not alone! Her grandchild, her precious nugget, Shonai, would be accompanying me!